A wonderful trip with Verda Herrington to visit one of her ex students Nuri and a chance to learn about the Jewish and Arab cultures and history. AMAZING! Start of trip to Jerusalem. More to come in April when I am back to speedy internet. I saw that same guy in that spot back in 2005. 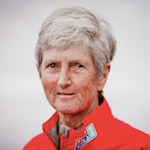 Linda McDavitt sailed around the world as part of the 2015-16 Clipper Race. On August 30, 2015 Linda and her ClipperTelemed+ teammates departed from London on a 40,000 mile journey across six continents, and returned 11 months later on July 30, 2016. "Thousands of people along the banks of the river all cheering us on. One of the best days of my life!"